I’m personally really, really psyched about today’s Summer Salad With Tea Vinaigrette recipe. After this winter, anything with the words “summer” and “salad” in them has me feeling like a heart-eyed emoji. I’ve watched Top Chef (one of my many foodie TV obsessions) since since 1 (that dates me, I know), so, um, Gail Simmons? I bow to thee. Tea in a vinaigrette? Well, that sounds awesome. Pure Leaf Tea in said tea vinaigrette? That’s even more awesome. Because to go along with this recipe they sent us some of their new flavors, and, guys, if you love tea, you’ll love them. (I’m an unsweetened tea girl so Black tea with Lemon is my new fave, but I also enjoyed the new Pure Leaf Tea House Collection flavors: Sicilian Lemon and Honeysuckle, Wild Blackberry and Sage, Fuji Apple and Ginger.) Love! But enough about me being all googly-eyed. 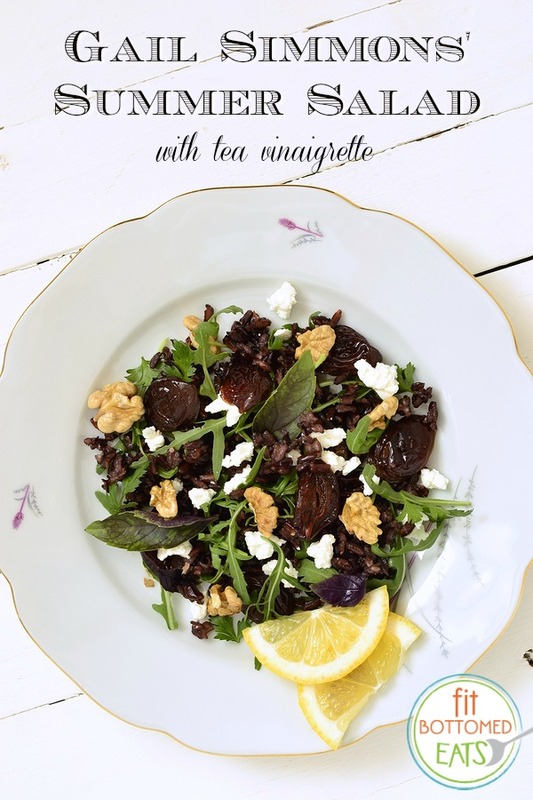 Let’s get on to this delicious Summer Salad With Tea Vinaigrette by THE Gail Simmons! Summer salad doesn't get more fresh or delicious than this one. Place arugula in a large serving bowl. Add snap peas and mint, and gently toss. Top with plums, nuts and crumbled goat cheese if desired. In a small bowl, whisk together the mustard, vinegar and tea. Add olive oil in a slow stream, whisking constantly to emulsify. Add salt and pepper, and combine. Drizzle vinaigrette over salad and toss to coat. Divide among four plates to serve. So simple. So fresh. So delicious! Um, I’m a southern girl and I can’t believe I’ve not heard of this before. Going into my lunch rotation asap. Thanks for sharing. I also love the “add goat cheese if desired…” it is desired. All of the goat cheese. Ever.